I remember week 10 and Day 62 well. 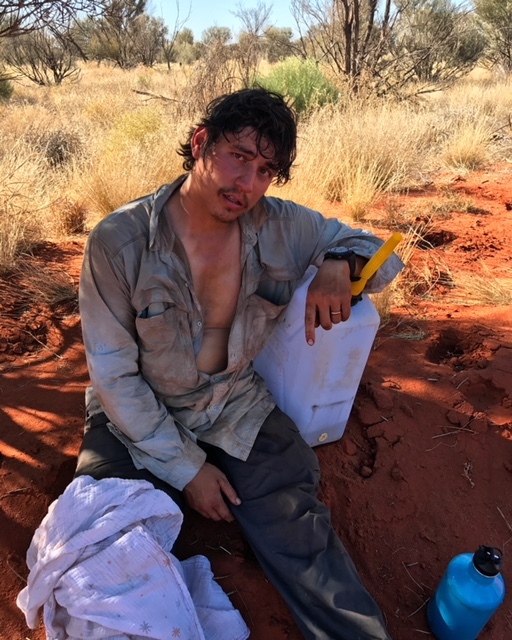 It was September 20th and it was not only one of the hottest days we had had yet, but it was also the date we had initially aimed at finishing, if we had been able to leave on June 20th like planned, before Justin got sick, and we got delayed. It was also our three-year wedding anniversary. 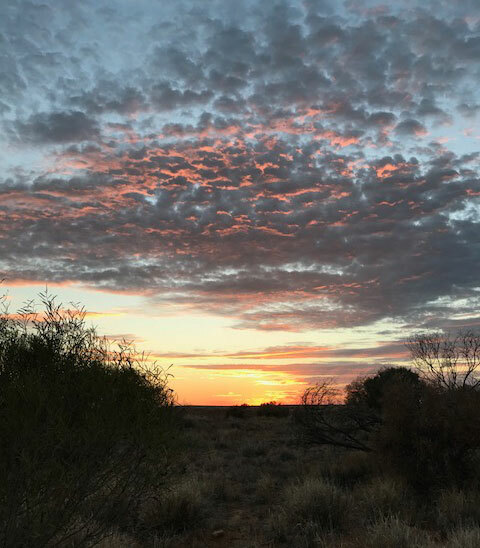 Normally in the mornings we got a bit of a reprieve from the heat but today, at 6am, the heat of the day was already bearing down on us and the flies seemed to be up an about earlier than ever. Awesome. It was such a contrast to the start of the trip where our mornings were huddled around the fire in our warmest puffy jackets, hats and gloves. Now Morgan was running around naked and eating her morning muesli out of a cup happily swatting away the pesky flies saying ‘buuu bye flies’! 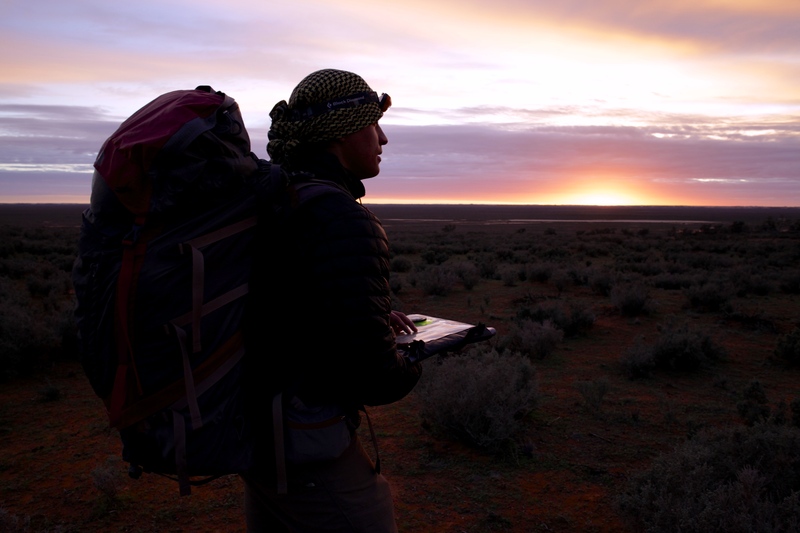 When you are on an expedition and pushing yourself to your physical and emotional extremes daily, there are some moments where you just want to call a time out. Most of these times, Justin and I are able to give each other the support and the love that we both needed. But sometimes, due to sheer exhaustion and spending what little extra reserves we had left in our own tanks on running after Morgan, we are not. Today was one of those days. Maybe it was because, in my head, September 20th was the date we were supposed to be finished. Now, here we were, nowhere close to the end and still had nearly 700 kilometers to go. Maybe it was because on what was supposed to feel like a romantic day, Justin and I felt more like two efficient teammates than married partners. If one of us was setting up the tent the other would be gathering wood for the fire. If one of us was getting our beds set up for the night, the other was making dinner. If one of us wasn’t keeping an eye on Morgan, the other of us was. 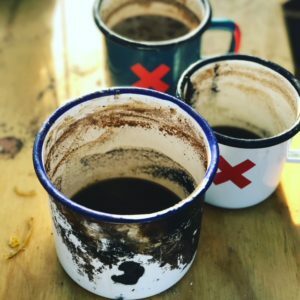 Lately it had been less about star gazing and cuddling around the fire drinking hot coco as I had fantasised in my head and more about executing necessary tasks, survival at its truest form and just getting through the day safely before ours heads hit the (blow up) pillows in pure exhaustion. This was the world of expeditioning, and I was learning it fast. Maybe I was just feeling a bit homesick and tired and we still had so much further to go. All I wanted this week was for someone to swoop me up, give me a big hug and a little TLC. Or even better yet, I just wanted to sit on my couch, binge on a whole season of the US Bachelorette with Ollie our labrodoodle and a tub of ice cream for a whole day. Was that too much to ask on our anniversary?!? 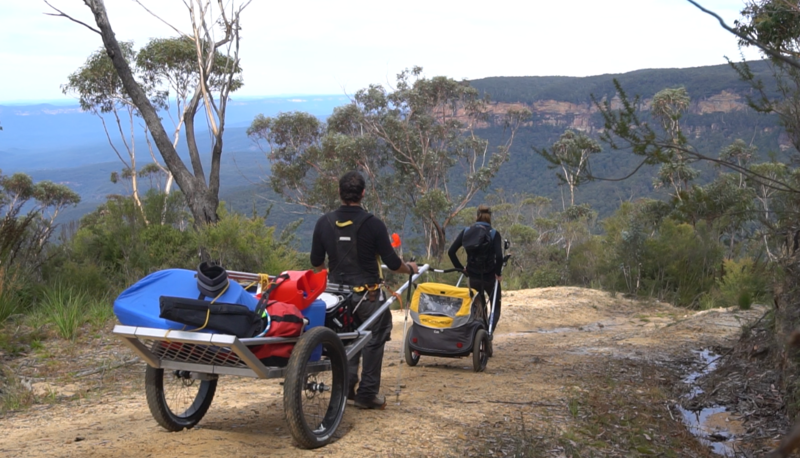 Alas, on an expedition, one of the main things is to just keep going. Its important to show up everyday, face the road before you and turn off that little part of your brain that says….why are you doing this anyway, all of this is crazy, and for what?!?! Just go home!!! 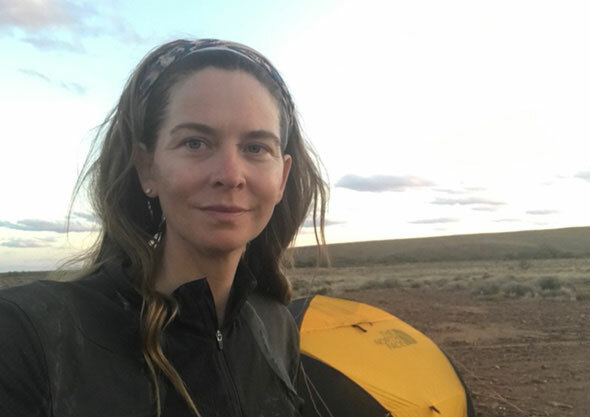 So instead of watching the final rose ceremony, we had to pack up the tent, our sleeping bags andour now increasingly dirty gear and start off again, just like the previous 61 days, to walk the Australian Outback. Today we had another day of 25km in front of us, and today, it was hot, really, really hot. 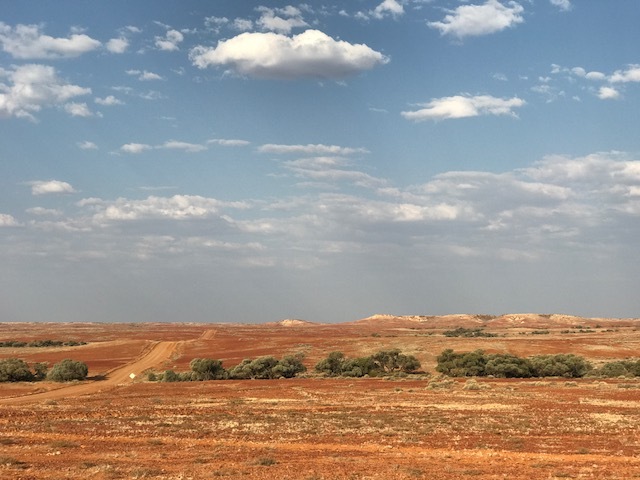 Temperatures were now starting to creep up above 40C and we had heard from a few locals that today was going to be around 42C. If that doesn’t really mean anything to you, let me paint you a little picture. It mans that when you take a piece of bread out to eat it, it turns to toast in a matter of seconds. It means drinking water that is remotely cold is only a dream after 9am. It means the ‘wind’ is like a fan forced ovens hitting your face. It means when you put eye drops in your eyes as a way to combat the dust you burn them as the drops are so hot. And the rest of the week followed pretty much the same pattern. Wake up, flies, hot, pack, walk, unpack repeat. It was like groundhog day. This wasn’t fun and we were so tired. The only one seeming to have a ton of energy and really loving the experience was Morgan. Just when you think you can’t take it anymore, a shift happens, emotionally or physically and the winds they change. You change your sails and your journey once again evolves. This week there were two reasons for this pleasant shift. One was a visit from our good friends know as the Adventure Junkys, Fuscia and Nigel, who were en route to deliver us our 5th food drop. During our planning phase, Justin and I had struggled to find anyplace during this leg of the trip to send it to. There were no towns, no stations, no postal addresses, nothing. 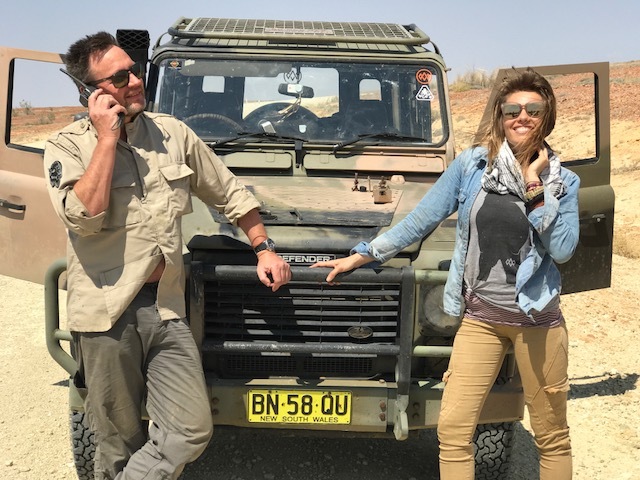 So the Adventure Junkys offered their support to drive a 3000km road-trip into the beautiful nothingness of Australian Outback, and drop it off to us. 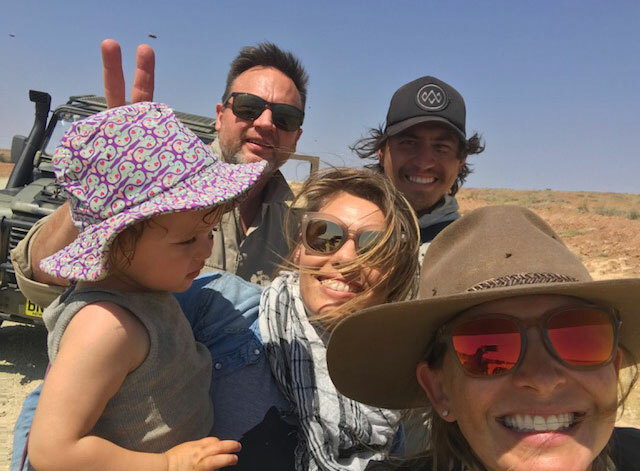 They even turned it into a mission – Finding the Jonesys– as they called it as half of the challenge and the fun was finding out where the heck we were! We love these two adventurous legends! 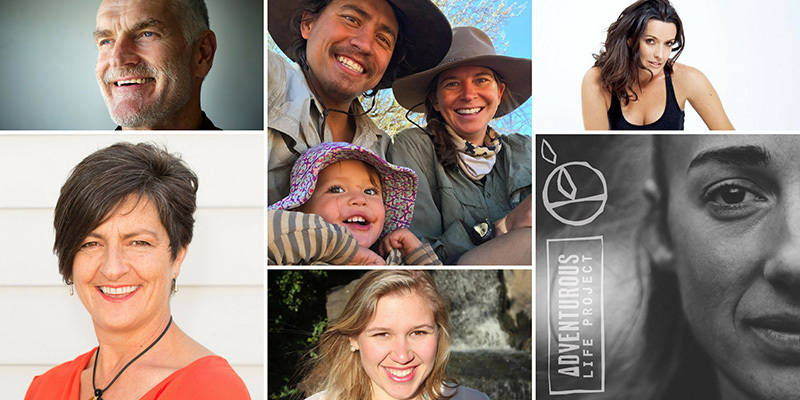 We love their spirt, what they do (they run a new social network for sustainable adventure travel – how cools is that?! ), who they are and especially we love their friendship. It was awesome to feel such support from our adventure community all the way out here. a bottle of wine and our next few weeks of food. It was just the boost we needed. 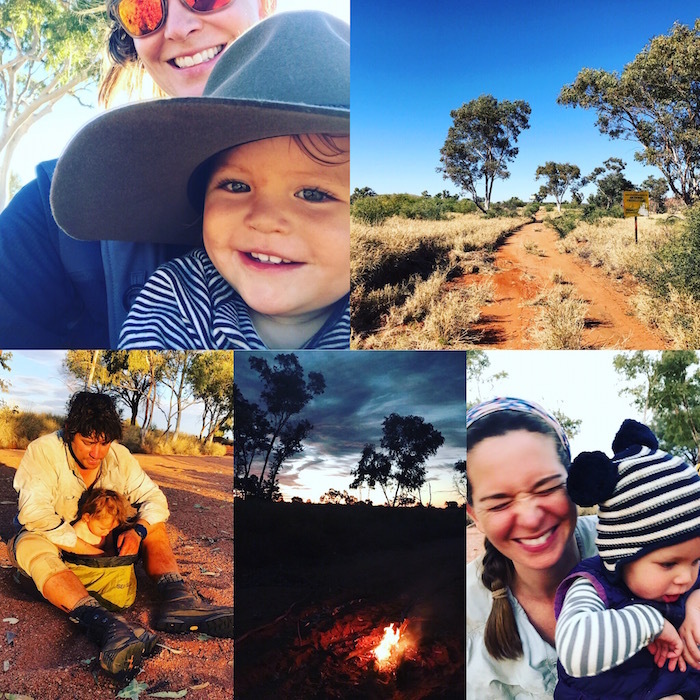 Justin and I were so excited to have them join us for a night and we were also excited to show them how much we had all grown and how comfortable Morgan and to be honest, I were both becoming in the bush. 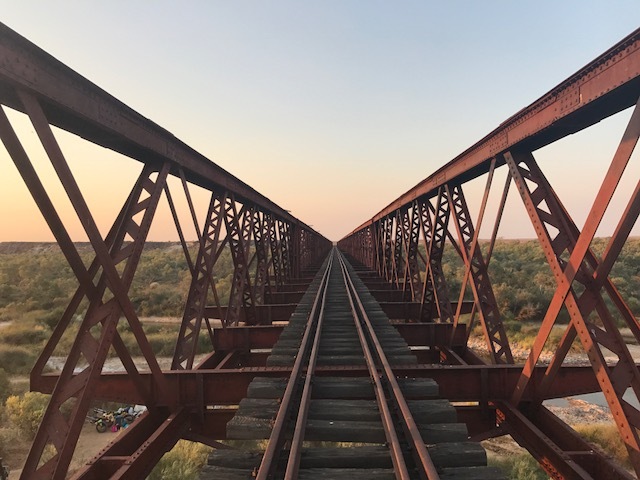 That night we camped at Algebuckina Bridge, built in the late 1800’s, it was the longest bridge of its time in South Australia. Here in the presence of friends, we found an amazing swimming hole to jump into, drank wine, ate bush pizza, laughed until our bellies ached and stayed up late watching the stars. 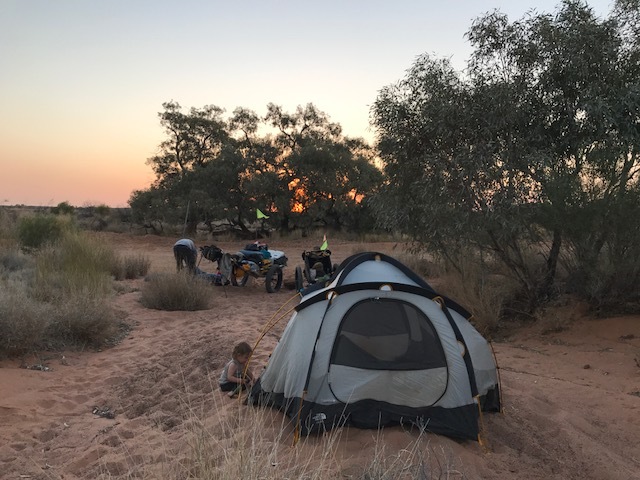 It was the perfect evening except the fact that we were in our first official ‘camp ground’ of the trip and the existence of other people, their toilet paper and their radios felt excessively intrusive after months alone out in the bush. We realized we had gotten very used to being alone. 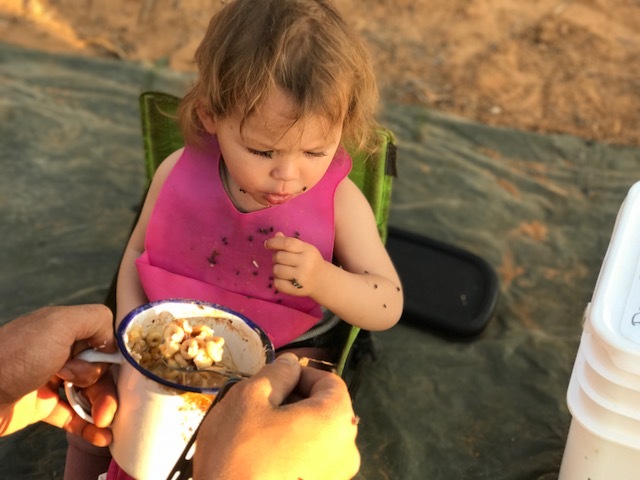 Then, after a lovely breakfast of our homemade bulk muesli and a what Justin and I referred to lovingly as our ‘true grit’ coffee*, just as quickly as they came, they waved goodbye and drove off in a plume of red dirt. 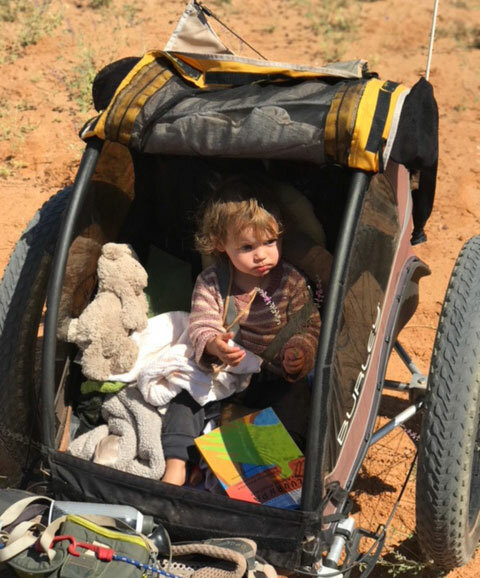 Our little support team headed back to Sydney and we were once again alone. 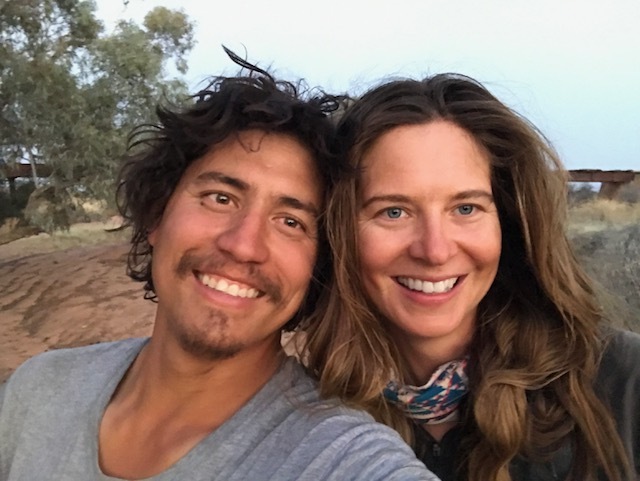 Justin and I hugged each other and committed to being kinder to each other and making more time for us as a couple, not just adventure partners. The next few days felt much lighter. Its funny how much your mood plays into things and how quickly lows can become highs on an expedition and in life really. When you are living fully, everything is amplified, every emotion, every taste, every sound. After what was a tough start to the week, I remind myself that the highs and lows are equally important and that old cliché that it’s darkest before the dawn is in fact true. 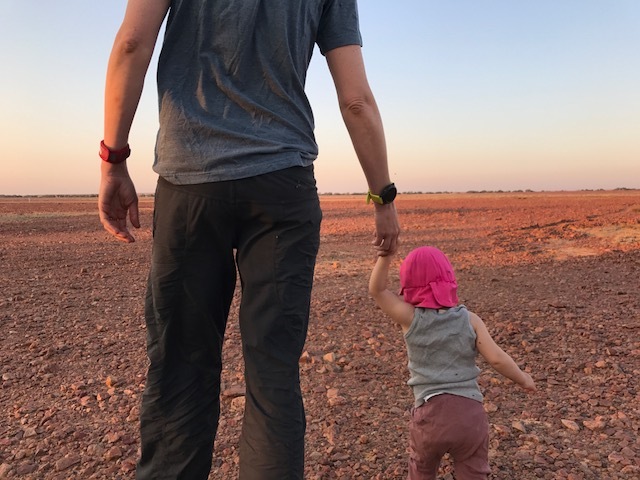 Justin and I were now once again ‘behind’ by 1.5 days as we had taken some extra time for the experiences we had agreed earlier on to prioritize – his parents visit in Oodnadatta and our half day respite with our friends. 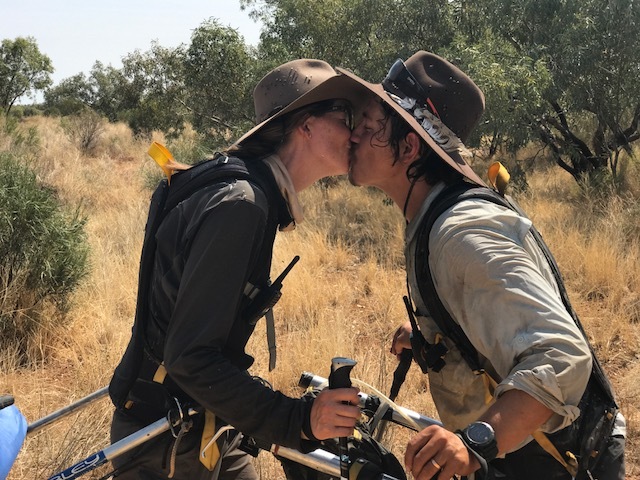 So what had been a target of 20-25km days was now a target of 25-30KM in order to end our expedition before the Outback became too hot and uncrossable. It may not sound like much but believe me, a few extra KM’s at the end of a long day can be a really big emotional hurdle to overcome. At first I felt overwhelmed by these distance changes but all of a sudden I felt a surge to tackle them, a knowing that we could and would hit our daily target. 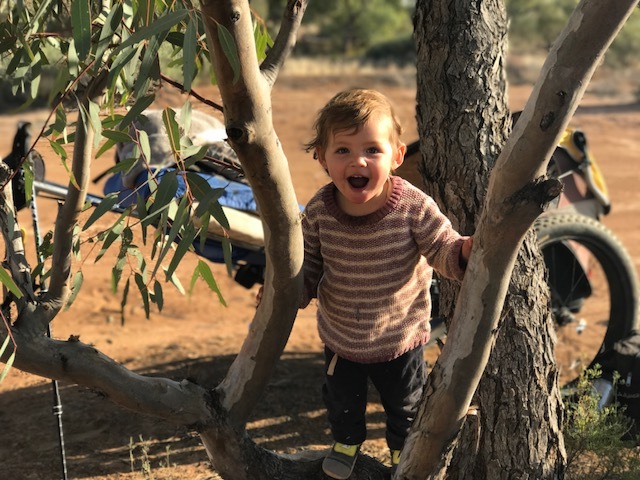 Morgan was not only walking in the Outback she was now running, she loved her new past times of hugging and climbing trees, she was happier entertaining herself than ever before, she seemed better at waiting for things as she was getting used to the fact that nothing out here came instantly. I personally was feeling much fitter, leaner and stronger than ever. I was in awe of my body and how it was going strength to strength. Then, out of the blue, on day 68, I finally found my adventure zen. It was like something just clicked and the whole day was perfect. The morning sunrise was out of this world and the flys seemed to sleep in that morning. There was a slightly cooler breeze during the day that made walking pleasurable, we found an amazing creek bed with the most beautiful tree to eat lunch and play under. 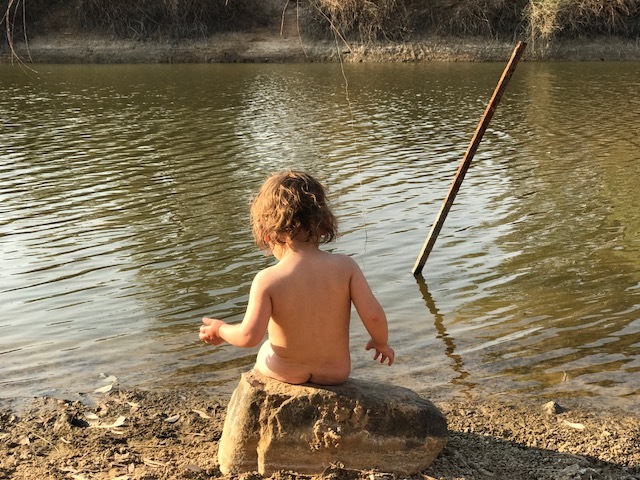 My music, podcasts, and Justin and my conversations about our future and the life we were creating – free, fun, adventurous, connected, alive – where just perfect. Then, just as the sun was setting, we hit one of our biggest days yet, 30KMs and we weren’t even tired! It was a bloody miracle. 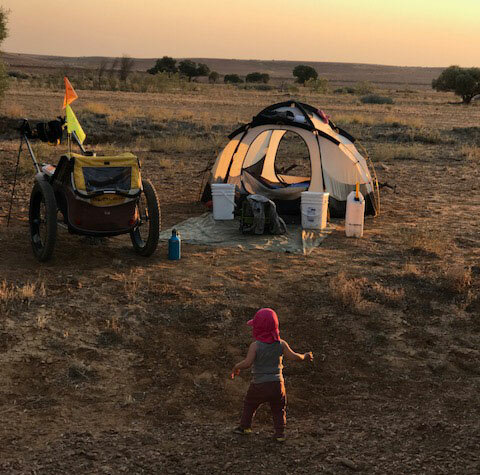 We happily got our tent up, made dinner and the setting sun lit the sky on fire, all while Morgan ran happily around and then quickly and easily feel off to sleep. It was truly ZEN. Adventure zen. This whole time, I had heard of this blissful feeling but I had thought it just had alluded me. At the start of the trip, I remember asking Justin, are you having fun yet? Because if he was, we clearly just had different definitions of fun. Heck the first time we did a trial camp back in Sydney, I thought enjoying camping like this might even be something people just made up. 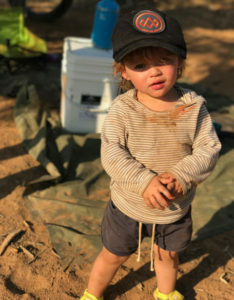 Now, in the middle of the Outback, dirtier than I had ever been, I was happier than I had ever been too. I had been bitten by the adventure bug. And the only question left was, what’s next?!! !